Grevillea jephcottii is variously known as Green Grevillea, Jephcott’s Grevillea and Pine Mountain Grevillea. 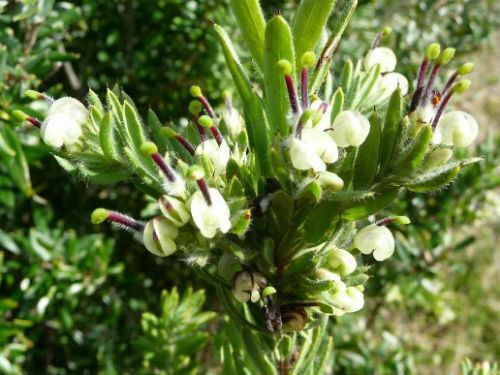 This rare native is found in small areas mostly in the Burrowa-Pine Mountains National Park in north-eastern Victoria. Grevillea jephcottii is an open shrub with upright growth habit. In our garden plants reach a maximum height of two metres. The leaves are light green, hairy, about three centimetres long with a slight twist. The flowers appear in mid spring and are initially a light cream-green then become yellow before blackening as they age. Styles are purple with white hairs. Blooms attract honeyeaters. Flowers circle the stems. This is an unusual feature for grevilleas. Grevillea jephcottii is a handsome shrub with attractive foliage and unusual flowers. We have found the species to be hardy, free flowering, has low water requirements once established and very tolerant of frosts. Pruning, after flowering, will keep plants dense and blooming bounteously. Propagate from seed or cuttings of young firm growth. The species is said to be a trifle promiscuous and may hybridise with other grevilleas in the garden. For this reason, cutting propagation is preferable to ensure plants are true to type. We find cuttings strike readily. In the wild Grevillea jephcottii is known to hybridise with a form of G. lanigera that also grows on Pine Mountain. The species has been cultivated in the UK and USA. The type specimen was collected on the south-west slopes of Pine Mountain, Upper Murray region of Victoria in 1964. The species is named after the Jephcott family of Ournie, in NSW just across the Murray River from Pine Mountain. A 14 year old family member discovered the plant in 1878.